(...)Now it is quite clear from all this explanation, with which I have given proofs from my statement spread over seventeen years continuously, that I am loyal to the British Government, heart and soul." (Exoneration pp. 5-7, Lahore Anjuman publication, part of Kitab-al-Bariyyah Roohani Khazain vol.13 p. 7-10). The above-mentioned quotes prove beyond a shadow of doubt that this so-called 'Reformer' of Islam, in fact wanted to reform Muslims into British slaves. He boasted: " It has always been my aim to convert these Muslims to have true faith in the British Government" (Tiryaq-ul-Quloob, Roohani Khazain, Vol. 15, P. 155). All his followers had in fact become just that. Under the teachings of their founder, Qadianis/Ahmadis had alienated themselves from the Muslim Ummah and to serve their non-Muslim Masters they willingly and faithfully fought against Muslims, spied on them and actively preached against even defending themselves against oppression etc. There is no compulsion in religion. One is free to follow or serve whosoever he wants. But in the garb of a Islam when a group/creed serves the interests of anti-Islamic forces, then such a movement is described as a subversive movement. The above statements give ample evidence as to why Ahmadiyya is a subversive movement that was planted in the core of Islam, with the support of western powers, to weaken and destabilize Islam. It is exemplary for the high level of tolerance in Islam, that by declaring Ahmadiyya to be a non-Muslim minority (1974, unanimous Fatwa of World Mulsim League), and provided they do not call themselves Muslims, Islam safeguards the religious freedom of a movement that is cleary subversive to Islam, and we call on all Muslim to respect this freedom. In fact the laws promulgated by the Consitutional Assembly of the Islamic Republic of Pakistan has done just that - guaranteed the freedom of practicing their religion. But Qadianis insist on calling themselves as Muslims. Knowing the beliefs of the founder of Ahmadiyya Movement, Mirza Ghulam Ahmad Qadiani, his thoughts about Islam, the Prophet of Islam, the Prophet Jesus, his views on Kalima and his views about Muslims, such hypocritical claims by the members of Ahmadiyya Movement infuriate Muslim masses. It should be remembered that no civilised society in the world gives right to the minority to incite the majority and create a law and order situation. The law promulgated in Pakistan on the one hand gives Qadianis the freedom to practice their religion, and on the other hand restrict them not to incite the feelings of the majority. The only reason why Ahmadiyya (Lahorism, Qadianism) operates under they guise of Islam is to hide its subversion against Islam, to intentionally deceive people. Otherwise, they have no reason to pretend to be Muslims as they so clearly collaborate against Islam. The following news appeared on ahmedi.org in late 2002, which is translated here. Special Note: Ahmedi.org had revealed some time back that Mehmudi Qadianis are getting grants from Israeli government in the name of their center. Till now Qadianis/Mehmudis have not dared to refute this news. Their criminal silence is confirming this report. Now some portions of an article on one website www.geocities.com/four.htm are presented here. This portion mostly exposes the intriguing role of Mehmudi Qadianis. Since this article has named certain persons, therefore Qadiani authorities should issue clarification on this matter otherwise the contents of this report will be considered as true and another anti-Islamic intriguing aspect of Mehmudiat/Qadianiyat will be on the forefront. If the Qadiani authority (Jamaat Ahmadiyya) wants to issue a clarification, then their view point would as it is be published. ..... A. S Khan. Report Published in Daily Ummat, Karachi. According to sources, where FBI had made offices mostly in five star hotels of Pakistan, Agha Khan Hospitals and other institutions are also their centers, from where FBI send daily fresh reports, films and activities to their headquarter in Washington. Instructions recieved in the light of those reports, are then implemented. Moreover two Qadiani and three Christian missionaries are explicitly working for American Investigative agency, FBI, against Al-Qaeda and banned Jihadi organisations. In the Qadiani Center, Markaz Al-Ahmadiyya, located behind White Grammer School in Gulshan-e-Iqbal, Investigative Cell of FBI has been established, where (alleged) members of Al-Qaeda and other organisations are kept after arrest. The Tableeghee Markat of Jamaat Ahmadiyya located in Gulistan-e-Jauher has also become a center of FBI activities. Qadiani Missionary incharge in Karachi, Maqbool Ahmad, has supplied a video film, which contain photographs of certain Mujahideens and alleged training camps have been pointed out. Moreover Qadiani Charity organisation, Fazle Umer, is cooperating with FBI at national level. The headquarter of this orgainsation in Rabwah, and its branch in Karachi, Ahmadiyya Hall, located at Jamshed Road, Magazine Line, Saddar, Karachi, is also in FBI's use. Cooperation of Qadianis with FBI was started at the instructions of Mirza Tahir (the 4th Khalifa). American government had sought Mirza Tahir's help through British government. According to sources, in return for their cooperation against the Jehadi organisations, Qadainis have been given assurances that US government would put pressure on Pakistan to remove them from the list of non-Muslim minorities. Three christian missionary organisations in Karachi are also cooperating with FBI, included among them are Dominican Center, Dar-un-Nijaat and FFM. Christian missionary, FFM (Friendship for Muslim), is playing an active role in the FBI operation against Al-Qaeda. Moreover, FBI activities are also going on in the public church, Assembly of God Church, located on Drigh Road Karachi. Sources said that through British government, a senior officer of American FBI, David Bernard, had met Mirza Tahir Ahmad Qadiani. It was revealed that the Qadiani Leader had given assurance of his complete cooperation. According to sources, Mirza Tahir Ahmad Qadiani had instructed the Missionary Incharge of Karachi, Maqbool Ahmad Qadiani, that he should provide all possible assistance to FBI in Karachi. It has come to the knowledge that Maqbool Ahmad Qadiani holds US citizenship, and Mirza Tahir Qadiani had appointed him the missionary incharge of Karachi and during the last one and a half year he had converted more that 300 Muslims to Qadianism. According to sources, after recieving instructions from Mirza Tahir, on 27th May Maqbool Ahmad Qadiani met a senior official of US investigative agency FBI, Alisa Murray David, at the US Consulate. Maqbool Ahmad, Massarat Ahmad and Tasawwur Ahmad Qadianis were present in this meeting, whereas from the FBI side the three member team contained a woman as well. According to sources, FBI Officer had instructed the Qadiani team that they want details about Al-Qaeda and banned Jehadi and sectarian organisations, Lashker-e-Taeba, Jaish-e-Muhammad, Harkat-ul-Mujahideen and Lashker-e-Jhangwi in Karachi; Qadiani team had assured them their full cooperation in this matter. According to sources, the second meeting took place in Marriot Hotel, in which Maqbool Ahmad told the FBI officer that they can use their three centers. The Markaz-al-Ahmadiyya in AlNoor Society is among the centers that Maqbool Ahmad had mentioned. Sources said that FBI sought permission to use the Qadiani missionary centers located in Gulsha-e-Iqbal and Gulistane Jauher. Later on 7th June the FBI team made a detailed visit to both these centers. When the FBI team reacher the Ahmadiyya missionary center located in Gulshane Iqbal, they were accompanied by the guards of Phoenix Company and two police mobile vans. FBI team remained there for 2 to 3 hours. According to sources, FBI officer had expressed to Maqbool Ahmad the desire to set up an investigative cell in the Ahmadiyya missionary center in Gulshane Iqbal, because there is no other such safe place in Karachi where they can keep the arrested mujahideens of Al-Qaeda and interrogate them. According to sources Maqbool Ahmad has given FBI the permission to establish the interrogation cell in the Qadiani center and has allocated four room for FBI. Sources say that after arresting the alleged mujahideens of Al-Qaeda, FBI teams bring them to the same missionary center and the initial interrogation from them is conducted here, whereas another source say that FBI only keeps the accused persons in this center. 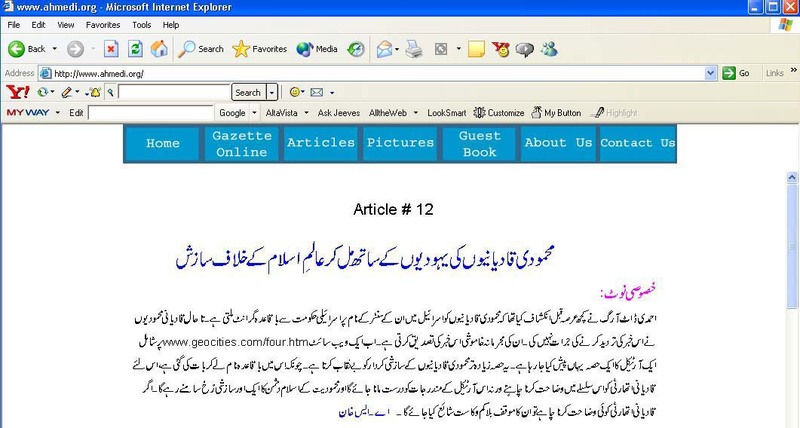 Ummat has leant that when FBI keeps any mujahid in the Ahmadiyya Missionary center, then more than 12 guards of the Phoenix Company are posted around the center; where as the Gulshane Iqbal Police Station is told that the Ahmadiyya Center is recieving anonymous threatening phone calls, upon which Gulshane Iqbal police increase their patrol around the Ahamdiyya center. According to sources, until now more than 15 times, FBI had brought arrested mujahideen to the Ahmadiyya Center and interrogated them. Sources have said that Ahmadiyya missionary centers have started gathering information regarding Jehadi groups, in addition to their missionary work, and have instructed all their centres in Karachi to gather information about Jehadi groups. Sources say that the Christian missionary orgainsation, Dominican Center has complete patronage of CIA and the members of Dominican Center in Karachi are also active as CIA agents. Sources say that certain National Security agency has reported to the Federal Government that the Christian Missionary Organisation Dominican Center in Karachi is working for CIA, but no action was taken on it. It was learnt that the incharge of Dominican Center is a man named Waseem, who is converting those Iranian to christianity, who migrated after the Iranian revolution. Sources say that the central office of this orgainsation is located behind the old CIA center in Saddar. According to sources, members of this organisation, Waseem, Peter Irfan, Peter Khurram, Mehboob and Micheal are in contact with an FBI officer, McMillan and supplying him with secret information. Christian Missionary organisation, Dar-un-Nijaat, is also working for FBI. Dar-un-Nijaat has 16 branches all over Pakistan. Sources say that out of 3 centers of Dar-un-Nijaat in Karachi, one is located in Gulistane Jauher Block 15, whereas other office is in Defense Phase 5 and ther third center is located on Abdullah Haroon Road. Sources say that the incharges of all three cneters, Simons, Fatehyaab and Nooro Maseeh are in contact with the FBI officer, McMillan. It is learnt that McMillan has also worked for CIA and has good influence on various Christian Missionary Organisations all over the world. Sources said that recently a report has been presented to McMillan by Dar-un-Nijaat in which 4 alleged mujahideens of AlQaeda have been pointed out. The four mujahideens that have been pointed out in the report are Abu Salim Masri, Abdullah Khayyam, Jameel and Abu Talha. Sources said that Abu Salim Masri and Abdullah Khayyam are most wanted by FBI. It was learnt that after getting information from Dar-un-Nijaat, FBI raided a house in Usmanabad to nab Abu Saleem and arrested two persons Hamid Ali and Feroz and interrogated them. Another raid was conducted in North Nazimabad Block I and arrested an Arab, Bilal. Sources say that Bilal is a student at a religious school in North Nazimabad and has been staying in Pakistan for the last four years. Sources said that after arresting Bilal, FBI took him to the office of Dar-un-Nijaat in Saddar, from where after initial interrogation he was transferred to an FBI interrogation cell located in Khayabaan-e-Rahat, and later on after detaining him for two days he was released. Sources say that in Karachi alongwith American FBI, Christian Missionary Organisation, Friendship For Muslim, is also actively engaged in operation against the Al-Qaeda. Sources say that the offices of this organisation is located in Clifton Zamzama Buolevard area, and its incharge in Karachi is a person named Shaukat. It is learnt that he is green card holder and is staying in Karachi for the last four years. Sources say that earlier Shaukat had worked for American CIA. Sources say that Shaukat had also supplied important information to FBI regarding banned jehadi organisations. It is learnt that FBI activities are also going on in Public Church and Assembly of God Church, located on Drigh Road. Sources say that people affiliated with the missionary organisations working in these churches are obtaining informations regarding Al-Qaeda and banned Jehadi organisations network in Shah Faisal Colony, Drigh Road and Malir area. According to this report of Ummat the raids conducted by FBI in Malir area were done at the instructions of one of the christian missionary incharge, Inayat, of Public Church. The creed created more than 100 years ago by Mirza Ghulam, to serve the then Colonial Masters, have found new Masters. The motives are the same, the reasoning is identical and the outcome is alike - to subvert Islam from within. Anti-Islamic forces have found a willing partner, a fifth columnist, in their fight against Islam. It should be pointed out that the purpose of presenting this article here, is not to condone terrorist activities of misguided people, but to highlight the role played by this subversive creed in collaborating with Foreign Intelligence Agencies. I am sure that the Government of Pakistan and its intelligence agencies are doing all they can and providing all the help they can, to nab the terrorists. Still the Foreign Governments have found in Ahmadiyya creed, a willing and trusted partner to work as their instrument - a fifth columnists - in their so-called fight against terrorism (which has more or less become synonymous with Islam). Such behaviour is an affront to the Government. Questions that come to the mind are: How far the followers of this creed, who are working in sensitive places in the government, can be trusted? With whom their loyalties lie? With their anti-Muslim track record, can their information supplied to Foreign Agencies be relied upon? Who can answer these questions?